I just spent a week of fun in the sun on my annual family vacation only to arrive back at home to face the cold winter elements. I used to shun the cold weather—it seems as if every time I stepped outside my sensitive skin would dry up, peel, and crack at the very hint of the bitter winter blast. Of course these remedies are completely natural, as I don’t want to buy a moisturizer full of chemicals. So if you want to avoid dry, leathery, and scaly skin this winter season, then pay attention! The thing I already miss the most from my vacation is swimming in salt water. Salt water does wonders for your skin, but obviously it’s not coming out of your taps. Instead, add some Epsom salts to a warm bath. Fill your tub and pour in a couple of cups of Epsom salts; soak for about 10-15 minutes and then get out. While your skin is still wet, gently rub some excess salt on areas that might need exfoliation and then pat yourself dry. Applying milk to dry skin can also help. Soak a washcloth in cold milk and then apply the washcloth to affected areas. Let it sit on the area for about five minutes to help exfoliate and moisturize the area. When you rinse the milk off, do so lightly and pat the area dry in order to ensure the lactic acid remains on your skin. 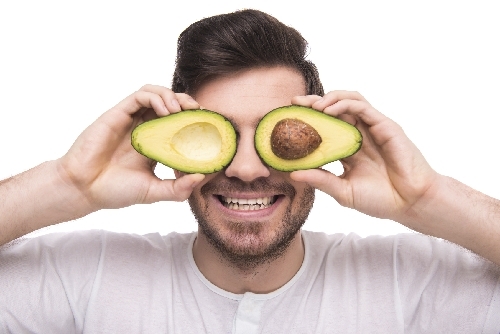 Using avocado to make a rub or mask is another great way to exfoliate and moisturize. Yes, I know that men are reluctant to sit around with a facial mask, but you should seriously consider it if you suffer from dry skin. Facial masks are not just for our female readers. My wife convinced me to try the avocado mask one winter and it really helped (and felt good!). Avocado contains alpha-hydroxy acids (AHAs) and vitamin E, which can help moisturize and strengthen dry skin. Cut the avocado in half, pit it, remove it from the skin, mash it up, spread it on your face and neck, and let it sit for about 15 minutes. Not having to deal with flaking skin is definitely worth looking goofy for less than half an hour. Aloe vera is helpful in healing dry skin. The acids found in aloe vera eat dead skin cells, which is why the plant is so frequently touted as a natural moisturizer. Aloe plants are not regularly available in most areas, so visit a health store to find the purest aloe gel you can. Look at the ingredients and make sure the one you pick isn’t jammed with chemicals and additives! Another way you can help prevent dryness—especially on your hands and fingers—is to switch from scented soaps to unscented soaps. The chemicals in heavily-scented soaps may lead to irritation or dryness in some people, so switching to unscented soaps could be helpful. I suggest going for an all-natural option such as goat’s milk soap. Dry skin is no good for anybody, man or woman, so keep your skin moist regardless of where you live and stay looking young! Trimarchi, M., “5 Things to Know About Lactic Acid in Skin Care,” How Stuff Works Health web site; http://health.howstuffworks.com/skin-care/information/health-factors/5-things-about-lactic-acid-skin-care.htm#page=0, last accessed December 2, 2015. “Natural Home Remedies: Dry Skin,” Best Health Magazine web site; http://www.besthealthmag.ca/best-you/home-remedies/natural-home-remedies-dry-skin, last accessed December 2, 2015.